Sporting two concerts from Las Vegas season 12, March-April 1975. Elvis was almost at his best during this Las Vegas season. Especially the March 22 show is great. Elvis is relaxed, harmonic, happy and focused. He sings good all through, listen out for his live versions of the recently recorded "Today" tracks. 'And I Love You So' is flawless, 'Fairytale' is very good and 'Green Green Grass Of Home' is even better than the studio version. On this show Elvis also adds 'You're The Reason I'm Living'. A nice version, most likely rehearsed, although hardly extensively. The sound quality is not better than found on bootlegs, a bit of a let-down, but really not surprising. 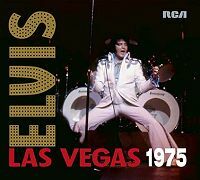 These Las Vegas recordings from 1975 are really poor compared to for instance February 1973! Some tracks from March 30 and 31 is also added. They both have Elvis' vocal out of focus and makes it less likely with a full release of either concert. The April 1 show on CD-2 is good, also. However, it seems that Elvis was better early in the season.